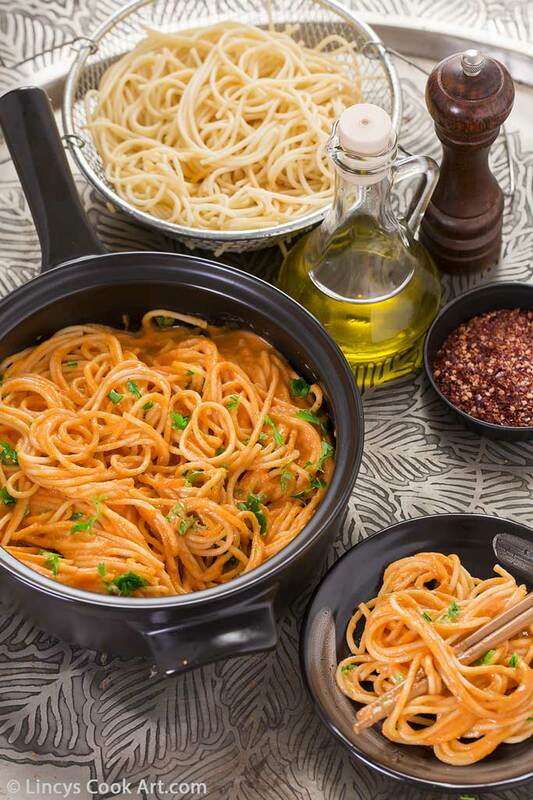 Spaghetti in Creamy Roasted Bell Pepper Sauce| Smoky bell pepper pasta recipe - I was looking for pasta recipes as my hubby is a huge appetite for pasta. I do not fancy pasta much. I can happily eat small portions but then, I can not take it as the main course. So I wanted to make a change in my palette and find best recipes which pastas made in a healthy way to make me want it as well and to suit it to my palette. I was experimenting pasta with colours and different flavours. 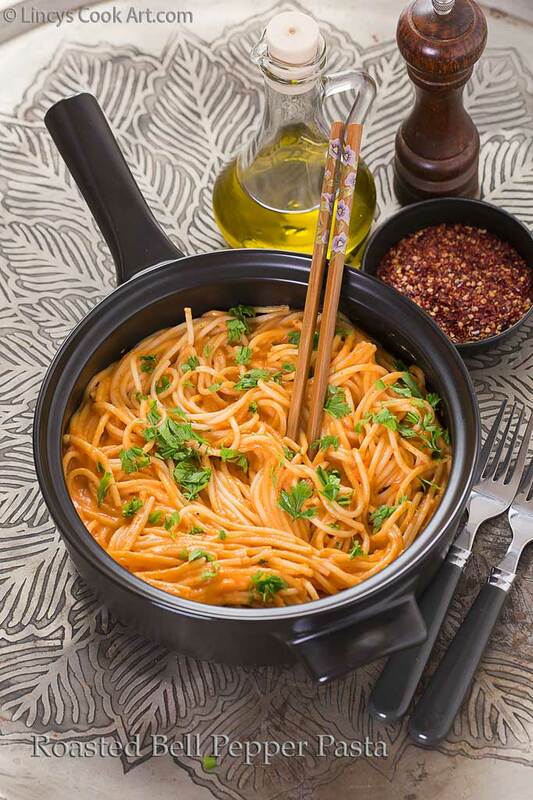 The recent trial is the roasted bell pepper pasta which has intense flavours. I made two versions, one for my hubby with milk and for me without milk, just added the ground bell pepper paste to pasta and relished the smoky flavour. Do try this dish I am pretty sure you are going to love it! Roast the bell peppers on stove top or bake them for 20-30 minutes on a preheated oven in a greased tray until the outer skin get charred and the flesh becomes soft. Wrap them on a kitchen towel or foil and allow it to sweat for another minutes. Meanwhile add oil in a pan; cook the onion and garlic with a pinch of salt till the onion starts to turn golden at the edges. Peel off the charred skin; remove the stem and the seeds. Chop them in to large pieces and grind it along with onion and garlic into a smooth paste. Cook the pasta with 6 cups of water and salt. once it cooked soft drain the water and rinse with cold water. In a wide pan add oil; once the oil is hot add the all purpose flour once it get heated up add the milk and allow it to boil; it starts to thicken. Now add the ground bell pepper sauce to make a creamy bell pepper sauce. Once the sauce starts to thicken switch off the gas and add the spaghetti or pasta of your choice. Season with salt and pepper. If you wish add some Italian herbs too for more flavour. Note: You could make this pasta in two ways with milk and with out milk too. If you like intense smoky flavour like me just add the cooked pasta into the pureed bell pepper paste no need to cook further. 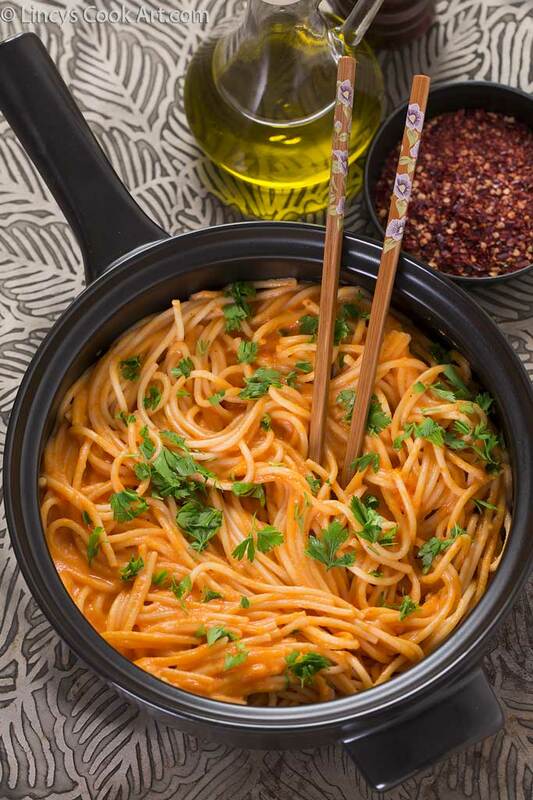 I am loving it.Super delicious pasta with a healthy twist. Always looking for a new and improved spaghetti recipe, and this one is totally drool-worthy. Need it! What do you mean by grind the bell peppers with the onion and garlic? You mean grind them in a blender? Yes that is what i mean. You could check the pictures if you donot understand. Thanks for asking. Ok thank you so much. I was having a hard time understanding what you meant. I checked the photos too but they weren't very clear. So thank you!